There can be no doubt of Dr Samuel Johnson's great achievement with his Dictionary: an astonishing work of scholarship that transformed our language. 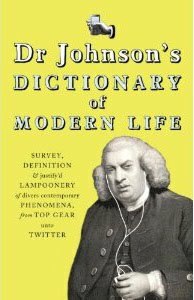 Now, after a hiatus of over 250 years, I am pleased to reveal that our favourite lexicographer has been putting the finishing touches to a brand new dictionary called Dr Johnson's Dictionary of Modern Life. The result of much painful labour at his home in Gough Square, the book will accompany Dr Johnson's popular Twitter feed and promises to address 'Divers Contemporary Phenomena, from Top Gear Unto Twitter'. I do not know as yet when this work will be released to the public, but I feel sure that it will meet with your warmest approbation. Enquire at Amazon Booksellers for further details.